Vaccines are one of the most important advances in the history of medicine. They’ve helped humankind more or less eliminate smallpox, and kicked measles out of the Americas with the exception of folks who’ve decided to believe a retracted, manipulated, widely-criticized study of twelve children. Vaccines are good. Gonorrhea, on the other hand, is bad. 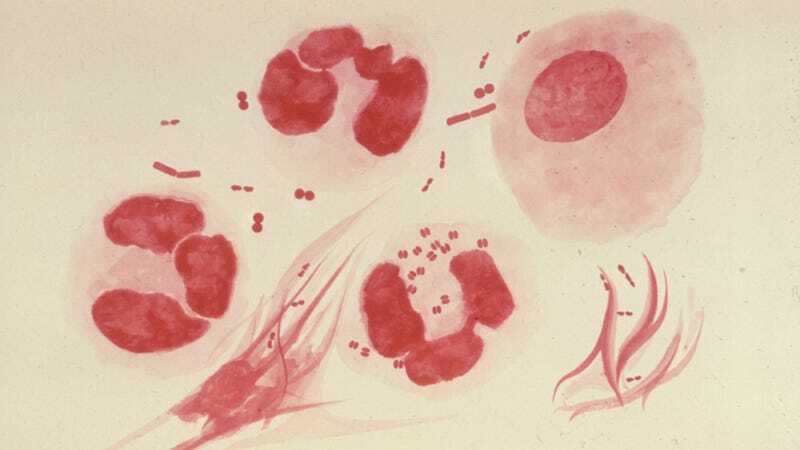 Sexually transmitted disease cases are on the rise in the United States, and experts around the world are now warning of the dangers of antibiotic-resistant gonorrhea. But a team of researchers in New Zealand has some hopeful news. It turns out that the meningitis vaccine seems to have led to a decrease in gonorrhea cases. This would be the first time that any vaccine has offered protection against gonorrhea, according to their study published yesterday in The Lancet. There are 78 million new gonorrhea cases a year, due to the sexually-transmitted Neisseria gonorrhoeae bacterial infection, reports the study. Gonorrhea can lead to awful effects like burning urination, pelvic inflammation, infertility and chronic pain, and can spread through the body. After a hundred years, there’s been no vaccine. But in the new study, the researchers found some data suggesting lower rates of gonorrhea in countries where lots of people received the “group B meningococcal outer membrane vesicle” vaccine, a meningitis vaccine. So hey, they thought, it’s worth taking a closer look. The researchers collected data from 11 sexual health clinics in New Zealand representing almost 15,000 people and around 1000 cases of gonorrhea. Folks who had received the meningitis vaccine were less likely to have showed up with a case of gonorrhea—the researchers’ math showed that the meningitis vaccine might have protected against 31 percent of gonorrhea cases. This sort of makes sense, as the bacteria are quite similar genetically, according to a statement provided by the authors to CNN. The study has raised hope, but it’s important not to overstate the findings. No one has done a controlled clinical trial—the team merely looked at retrospective data. The researchers point out in their study that you might not be able to generalize their findings to everyone in New Zealand, since some folks with gonorrhea don’t go to sexual health clinics. The sample might not be a representative spread of New Zealanders. And again, no one has actually given a meningitis vaccine to anyone to see if it worked against gonorrhea a clinical trial. But, we still have an association demonstrating that a gonorrhea vaccine might be possible, wrote Seib. And that’s a good start. For some reason, I have a gut feeling that a gonorrhea vaccine is something that even antivaxxers would have an interest in. Don’t ask me why.